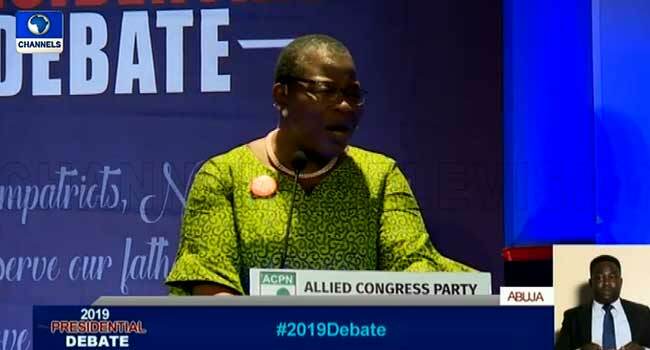 Presidential candidate of the Allied Congress Party of Nigeria, Dr Obiageli ‘Oby’ Ezekwesili has withdrawn from the 2019 Presidential race. A statement released by the former Minister of Education early Thursday, which was also shared in a series of tweets on her Twitter handle, revealed that she stepped down from the race to “focus on helping to build a Coalition for a viable alternative to the #APCPDP in the 2019 general elections,” that would allow Nigerians to exercise choice without feeling helplessly saddled with the #APCPDP. “Following the reactions of Nigerian citizens at home and abroad to the 2019 Presidential Debate held on Saturday 19 January 2019, and after extensive consultations with leaders from various walks of life across the country over the past few days. I have decided to step down from the presidential race and focus on helping to build a Coalition for a viable alternative to the #APCPDP in the 2019 general elections. From last year, I have made it clear to the nation that Nigeria has always had a 20 year cycle of change – 1959, 1979, and 1999. The decision by the former World Bank Vice President to support a coalition of alternative candidates that will challenge the country’s dominant parties; the All Progressives Congress (APC) and the People’s Democratic Party (PDP), whose candidates she has often made reference to in her campaigns as ‘Butiku,’ to mean that they are one and same, has been received with mixed reactions around the country, with many (especially among the youth) describing the withdrawal for the motive she mentioned as ill-timed. It remains to be seen however who she will be endorsing for the nation’s top political office, having stepped out of the race.